This game is a great ice breaker games for the first time a new group of kids gather together. This game gives children a reason to talk to each other without wondering how to start the conversation. Go through old magazines or calendars and cut out pictures of objects, or print them from a clip art file. Keeping the pictures hidden, tape one picture on each child's back. Make sure that child doesn't know what is in the picture. Have each child ask another child questions to help him figure out what is on the picture. The questions must be answered with a yes or a no. 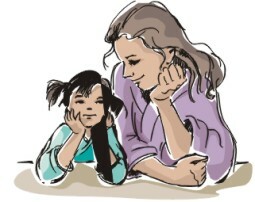 Two children can take turns asking their own questions, or move on and ask questions of another child. The children will have to move around a lot and turn their backs to show the picture before asking a question. When a child figures out the picture, tape another picture on his or her back. Play the game for a set amount of time (about 10 - 15 minutes) or until every child has figured out at least one picture. If the group has a theme, find pictures that relate to the theme. A sports camp could use pictures of sporting equipment. A nature club could use animal photos. If the kids cannot figure out what types of questions to ask, here are some ideas. Would you use me every day? Do I cost more than $100? Once they get some idea of what is the object, then they can ask about details.